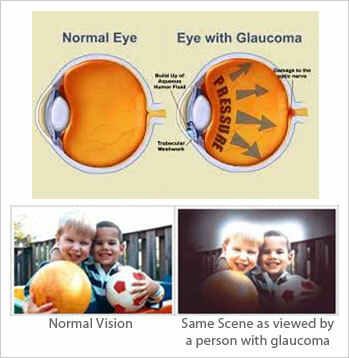 Glaucoma is a term for a group of eye disorders which result in damage to the optic nerve. This is most often due to increased pressure in the eye. The disorders can be roughly divided into two main categories: "open-angle" and "closed-angle" (or "angle closure") glaucoma. Open-angle chronic glaucoma is painless, tends to develop slowly over time and often has no symptoms until the disease has progressed significantly. Closed-angle glaucoma, however, is characterized by sudden eye pain, redness, nausea and vomiting, and other symptoms resulting from a sudden spike in intraocular pressure. Glaucoma can permanently damage vision in the affected eye(s), first by decreasing peripheral vision (reducing the visual field), and then potentially leading to blindness. Glaucoma has been called the "silent thief of sight" because the loss of vision often occurs gradually over a long period of time, and symptoms only occur when the disease is quite advanced. Worldwide, glaucoma is the second-leading cause of blindness after cataracts. It is also the leading cause of blindness among African Americans. It Has Been A Wonderful Experience. I Am Finally Out Of The Constant Fear Of Losing My Vision Will The Passage Of Time. Thanks To Vision Yoga I Have Been Able To Overcome This Fear. A Reduction In My Eye Number Power Is A Bonus That I Have Had. Thanks Also To The Staff Willing To Guide Though I Feel Is This Area Little More Attention In Required. I Was Suffering From Acute Glaucoma. The Pressure In My Left Eye Had Gone Up To 26 And The Pressure In My Right Eye Had Gone Up To 22. After 15 Days The Pressure Becomes Normal In Both Eyes. My Vision Has Improved Considerable By Doing The Exercises. I Highly Recommend For Securing Lasting Benefits For Eye Disorders. Thank You For Giving Back My Confidence. Vision Yoga Helped Me In Improving My Eye Sight And From Getting Over From The Fear Of Becoming Blind. Thank You Once Again For All Those Who Helped In My Eye Exercise. Thank You Sir.